Common signs of mold growth in a basement include musty or stale odors, moisture staining or suspicious growth on surfaces such as walls, wood or contents. Mold needs two things to survive: a moisture source and a food source. Unfortunately for homeowners, most basements provide both of those ingredients, making them a perfect breeding ground for molds. Mold will feed off of any cellulose-based products such as wood or drywall. As for the moisture source, just because you haven’t had a flood or water loss event, does not mean there isn’t moisture. When relative humidity levels exceed 55%, there is enough moisture in the air for mold to grow. 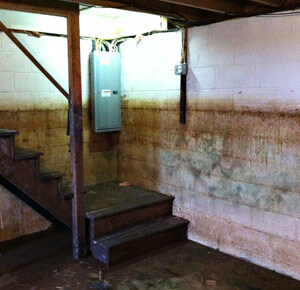 Do You Need Mold Remediation in Your Basement? If you are visibly seeing mold in your basement or if you have had mold testing done to confirm that you have a mold issue, contact us for a free estimate for mold remediation. Click Here to download a FREE brochure of Tips on Preventing Growth Mold in the Basements.